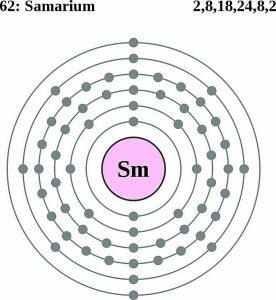 Samarium (pronunciation seh-MER-ee-em ), represented by the chemical symbol Sm , is a bright, fairly hard lanthanide element belonging to the family of rare earth metals [1, 3]. It has seven known natural isotopes with mass numbers 144, 147, 148, 149, 150, 152 and 154. 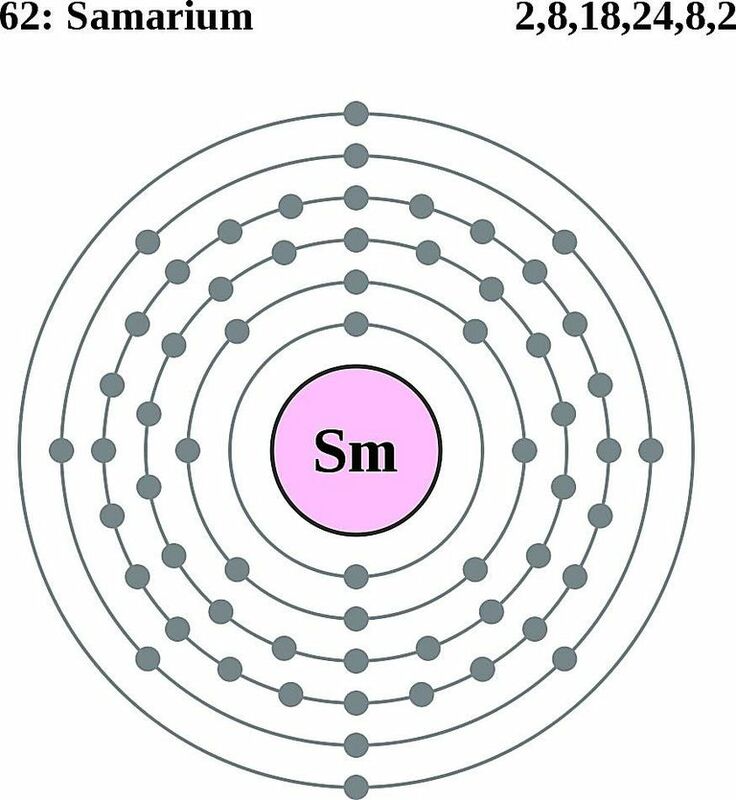 Sm 147, 148 and 149 are radioactive with half-lives 1.06X1011 years, 7X1015 years and 1016 years respectively. The other isotopes are stable [1, 2]. It is reactive with air, water, halogens and acids . The element can be found combined with other lanthanide metals in several minerals the principal ones being bastnaesite and monazite. It is separated from the other constituents of the mineral by the procedures of ion exchange and solvent extraction. Recently, samarium has been separated from other lanthanides by electrochemical deposition. Its oxide can also be reduced by barium to yield the metal . Ores containing the metal can be found in mining sites in India, Sri Lanka, Brazil, China, Australia and the US . World production of samarium oxide is around 700 tonnes per year . Origin of Its Name: It is named after the mineral samarskite from which it was first extracted . Who Discovered It: French chemist, Paul-Émile Lecoq de Boisbaudran discovered it in Paris [1, 3]. When Was Samarium Discovered: Its discovery year is 1879 . 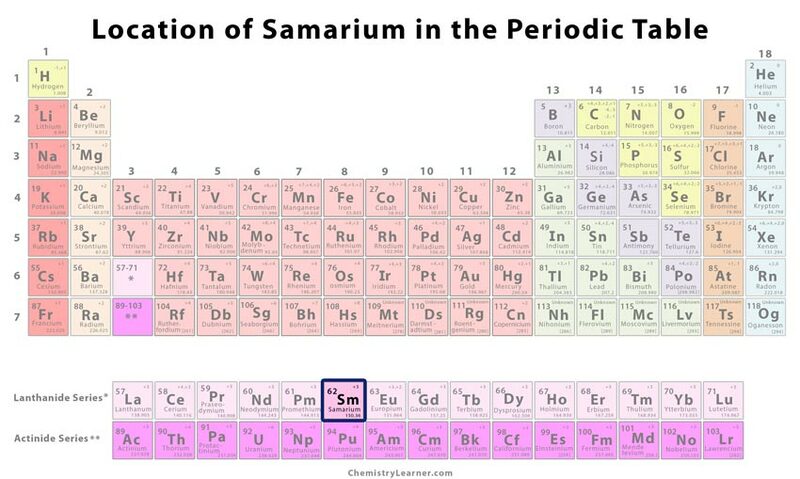 Samarium had eluded the chemists of 1800s. 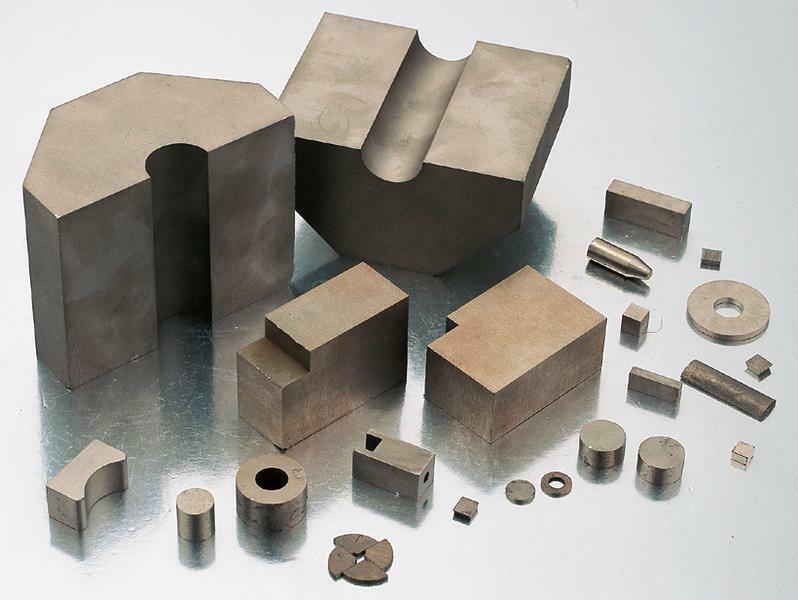 It all began with the discovery of cerium in 1803. It was suspected of being in combination with other metals and in 1941 Swedish chemist Carl Mosander isolated didymium and lanthanum from it both of which he claimed to be elements. Though he was right about lanthanum, Boisbaudran proved him wrong about didymium with his findings in 1879. He first extracted didymium from samarskite and then prepared a solution of didymium nitrate. He added ammonium hydroxide to it and collected the precipitate that was deposited in two stages. He focused on the first precipitate and measured its spectrum that revealed a new element. 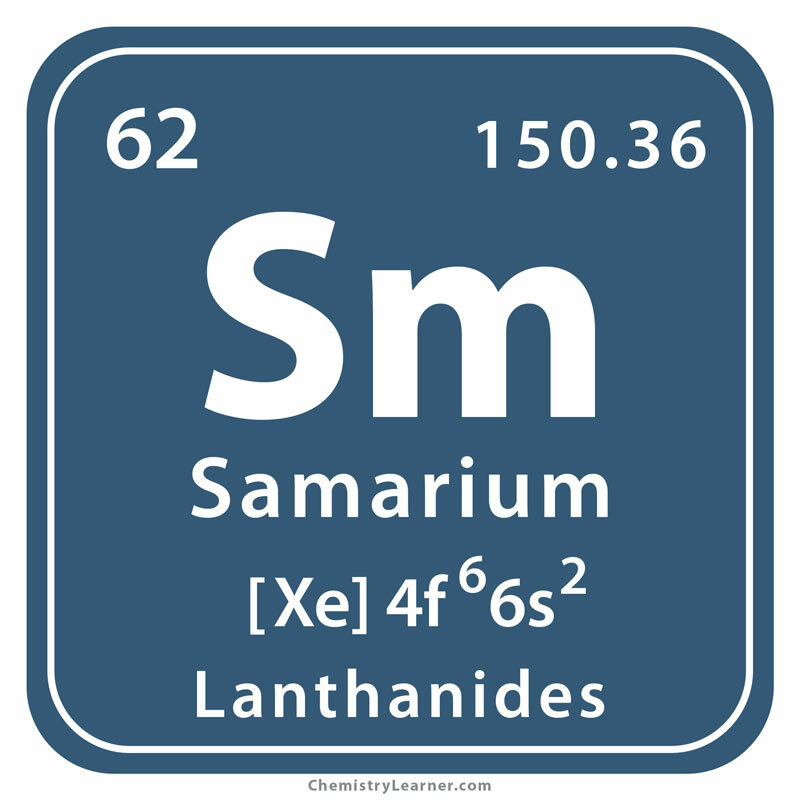 It was named samarium that eventually yielded other rare earths, gadolinium and europium in later years . Samarium cobalt (alloy) magnets are more powerful than the iron ones. Their property of not losing their magnetization even at high temperatures enable them to be used in microwave applications. They brought about the miniaturization of electronic devices such as headphones and the development of personal stereos . 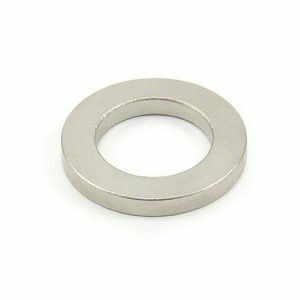 They are also used in the pickups of some electric guitars, air conditioners, small motors [3, 6, 7] and magnetic therapy jewelry . Samarium 153 is used in injections for the treatment of painful bone metastases  in lung, breast, prostate and other types of cancer patients . Samarium doped calcium chloride crystals, Sm doped YAG and samarium doped quartz are used in optical lasers [1, 18, 22]. Samarium oxide is used in glass and ceramics . It finds application in carbon arc lighting for studio projection and lighting . 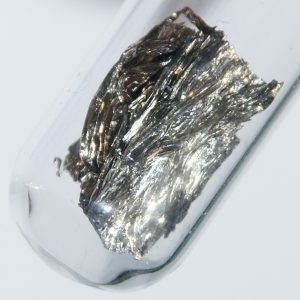 Samarium 149 is used in the control rods of nuclear reactors as a fission product poison [8, 17]. It is used as a reducing agent in Barbier reaction of carbonyl compounds and Grignard-type reactions [10, 12, 14]. 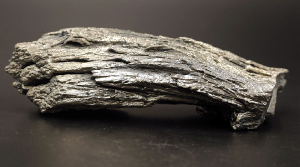 Samarium-neodymium dating is used to assess the ages of certain geologic materials. The process uses the radioactive decay of Sm 147 and neodymium 143 . Samarium reagents are used in organic syntheses . 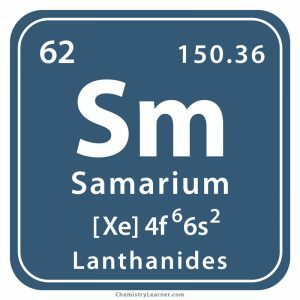 Samarium has low to moderate toxicity [1, 3]. High pressure (up to 40 GPa) X-ray diffraction studies on the metal revealed the participation of its f-electrons in bonding that is in close resemblance to cerium and americium . The pure metal is priced at $360 for every 100 gram .